Though you're not one of the dumbest travelers of 2015, you may have seen this video and been like, "Man, I bet if I posted a video of myself roasting a marshmallow on top of a volcano, I could totally add, like, 2,000 more Instagram followers." But there's a reason everyone referred to Simon Turner as a "daredevil" when he did that: he had to climb to the top of a mountain and rappel into a crater filled with a lake of lava -- aka, stuff you probably can't and/or don't want to do. But you know what you can do? Hike... into a volcano. Yep, there are actually a number of active ones around the world where you can pretty much grab a bag of spongy sugar and stroll right in to make some Earth-steamed s'mores (or at the least, stroll right up the top). These are eight of the coolest volcanoes with trails for all levels of hikers, from advanced climber to intermediate speed-walker. While it's not one of the 25 most visited national parks in the US, the stuff bubbling from the ground at this park on the Big Island makes Old Faithful look like a water fountain. 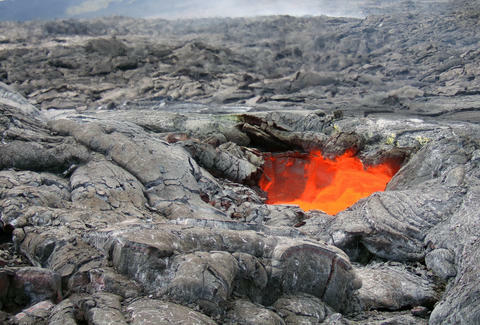 Here you can get blasted by natural steam and volcanic gasses as you hike 11 miles around the open rim of Kilauea. Or if that's a little too much walking for you, opt for the shorter, four-mile trail to Kilauea Iki -- it leads right down to the caldera floor. In all, the park has 150 miles of trails from which to appreciate hot magma and natural rainforest. Picture it: Sicily. 500,000 years ago. The European and African tectonic plates clash and Mt. 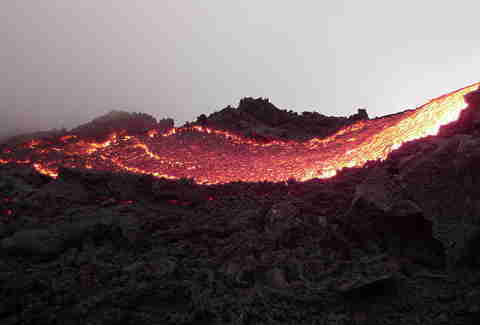 Etna is formed, the tallest and most active volcano in Europe. And even though this thing has been erupting for pretty much all of human history, people still want to climb to the top. Although nowadays, a cable car will take you halfway up. From there, visitors hop a 4x4 to the trail head before hiking to the top of the steam-billowing crater where they're rewarded with a stunning panorama that stretches all the way to the Mediterranean. 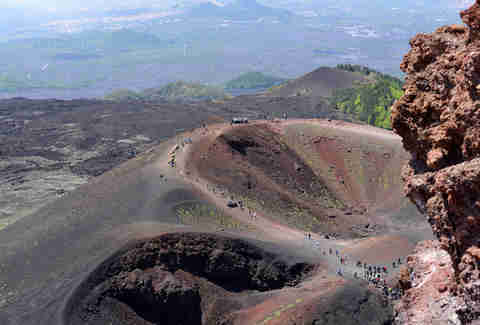 The region is also home to Stromboli (no, not the food) -- another active volcano you can hike on longer expeditions. 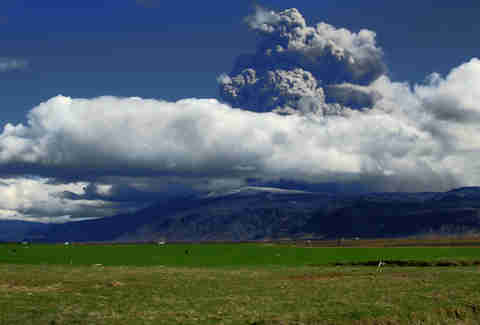 You may remember this lovely volcano from 2010 when it delayed every flight in the world for a week. It's about a two-and-a-half hour drive from Reykjavik to the base, where you'll begin the steep ascent to the 5,500ft summit. The hike takes about four hours and a good portion of it crosses glaciers, which means that even if you brought your crampons, best still to take a guide. Along the way, you'll gaze (through rising steam, of course) at the Icelandic coast on one side, and crazy lava formations on the other. 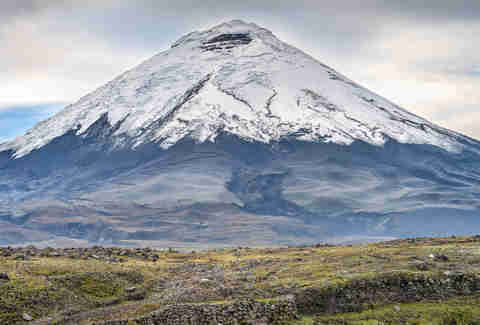 The main attraction on Ecuador's famed Avenue of the Volcanoes in the Andes Mountains is Cotopaxi, a 17,500ft active rock that requires a difficult, two-day climb to summit. Once you reach the top, some outfits will actually let you mountain bike down at least part of it. Although if you're not THAT crazy -- or don't have loads of Andean volcano climbing experience and would like to try some easier peaks before toppling the behemoth -- there are multi-day tours that provide a good warm-up. 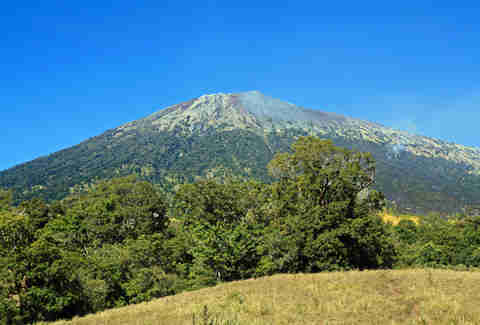 Your best route up this peak in the Pacific "Ring of Fire" begins at Sembalun Lawang and involves hiking to Pelawangan II, a spot in the northeastern part of the crater. 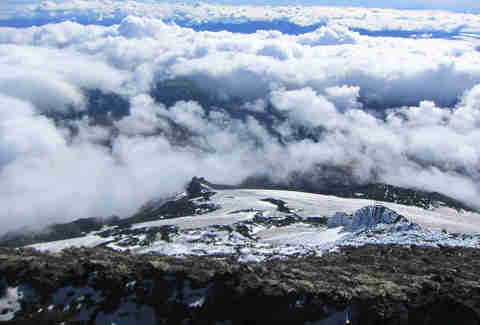 There you'll spend (part of) the night before heading out around 2am to reach the summit before sunrise. Which is good, because by mid-morning clouds form over the rainforest and usually block the best views. There was a time when you could walk right up to the lava flows at this active volcano near Antigua and stand there until your shoes melted. (Un? )fortunately, the folks at Pacaya Volcano National Park decided that might not be the SAFEST way to visit and restricted access to points before the lava. That said, it's definitely still worth the short but strenuous two-mile hike past hot steam eruptions and lava rock formations. And if you want even more volcanic action on your Guatemalan vacation, the crater at Cerro Quemado isn't far away either. The hike to the world's largest active volcano crater might also be the easiest: A short 10-minute walk up a paved road at Poas Volcano National Park brings you to an observation deck where you can gaze out at the mile-long caldera. The middle of said caldera is a 1,000ft deep turquoise lake, and its 50ft drop in the past 15 years has some experts speculating that Poas is due for an eruption. 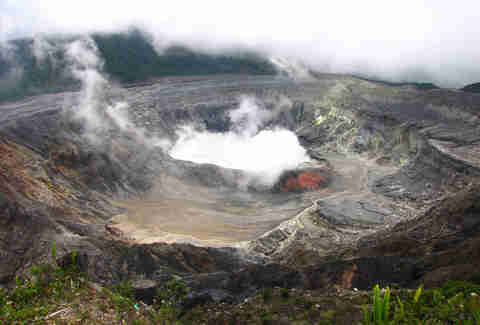 Poas' second crater, a bright green tropical mountain lake, is considered one of the most beautiful sights in Costa Rica. And the hardest hike? Well, that would be this volcano in Patagonia, the most active in the Andes. 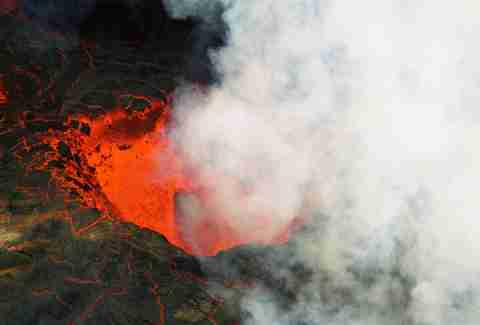 It's one of only five volcanoes in the world with an actual lava lake in the crater and its liquefied eruptions are even more violent as result of the lava mixing with melted snow. To get there, you either need to hire a guide or be a VERY experienced climber. Or, if you'd rather just appreciate this peak (as well as Osorno and the other Torres del Paine mountains) from the comfort of a nice mountain bike, there are tours that will lead you through all of it. Matt Meltzer is a staff writer with Thrillist, and is a little sad that the highest point in his home state is a freeway onramp. Check out all his great Florida vistas on Instagram @meltrez1.